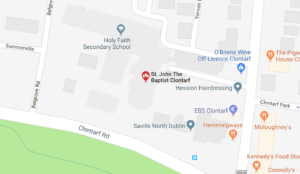 Welcome to the website of Saint John the Baptist Catholic parish in Clontarf. John the Baptist understood his role as bringing people to Jesus. The local church is now called to bring people to Jesus and to reveal him by how we live, serve one another and worship. As a parish community we are called to support one another in our call to bear witness to Jesus as the Light of the World, as the Way, the Truth and the Life. We hope that our parish website helps you to feel a sense of belonging to our parish community. The Easter Garden Group, consisting of Bernadette, Clare and Pauline wish to thank all those who donated flowers and plants for the Easter Garden and a special word of thanks to Joe Murray, Carpenter, for making the cave and the cross for the Garden. 6.00 pm Vigil Mass and 10.00am Mass. At the beginning of today’s gospel reading, we find a very sorrowful Mary Magdalene. She is outside the tomb of Jesus weeping. Not only has Jesus been crucified, but now, in her judgement, some people have stolen his body. When someone dies tragically and the person’s body is not found, it makes the grieving process for loved ones all the more difficult and complicated. The risen Lord was present to Mary in her grief, just as earlier in John’s gospel Jesus had been present to the grieving Martha and Mary in the wake of the death of their brother Lazarus. Yet, Mary Magdalene’s grief blinded her to the presence of the risen Lord. The risen Jesus was no less present to his disciples than he had been during his public ministry, but his presence as risen Lord was of a different quality. He had been transformed through his resurrection from the dead and the mode of his presence to his disciples had also been transformed and wasn’t as easily recognizable. The two disciples on the road to Emmaus did not recognize him in the stranger who journeyed with them. With the exception of the beloved disciple, the group of disciples in a boat on the Sea of Galilee after Easter did not recognize the Lord in the stranger who called out to them from the shore. Now Mary Magdalene images the risen Lord who speaks to her to be the gardener. We too often fail to recognize the many ways the risen Lord is present to us. He can be present to us in the gardener, or in the one who walks with us on our journey or in the one who calls out to us from the shore. The same kind of deep sadness that Mary Magdalene experienced can blind us to the Lord’s presence to us in such dark times. Mary Magdalene recognized the risen Lord when he called her name, when he related to her in a very personal way. The Lord calls out to us by name too; he wants to enter into a deeply personal relationship with each of us. This Easter we are invited to allow ourselves to become more attuned to the Lord calling us by name, speaking a word of light and life into our own uniquely personal situation in life.